Your dog could be suffering from this painful disease (or other joint problems) and you may not even know it. This is because dogs are genetically "programmed" not to show pain, because showing any kind of weakness in a wild pack, could mean banishment or even death. In this post we are going to cover joint supplements for dogs, what they are, their benefits and the signs indicating your dog may need a joint supplement. Plus, we'll take a look at five of the best joint supplements for dogs on the market today. - Pure and 100% natural formula. gluten, yeast, corn, milk or soy derivatives. - Organic and human-grade ingredients. - No harmful additives, fillers or colors​. - Uses natural Yucca which is good for arthritis pain/inflammation. ​- Natural and delicious chew. ​- Two free ebooks included. - Uses all natural ingredients​. - 100% money back guarantee​. - Also contains 300 mg of Chondroitin​. - Each tablet contains 500 mg each of Glucosamine Hydrochloride and MSM (Methylsulfonylmethane)​. When Does My Dog Need a Joint Supplement? Although some experts recommend giving a joint supplement to your dog starting as early as one-year-old (especially for those dogs prone to hip and joint issues) it should be given when your dog enters its senior years as a preventative measure to arthritis, general joint inflammation and hip and elbow dysplasia. Now that we've covered all those helpful facts about joint supplements, here are our top five picks for best joint supplements for dogs. One concern may be not all dogs will enjoy the chewable flavor of this tablet. Made in the USA in a USDA inspected facility, the Genuine Naturals brand is setting the bar high for the competition. These natural chews are packed full of goodness and include; Glucosamine, Chondroitin, MSM, Organic Turmeric, Dried Yucca, & other natural ingredients to help support your dog's joints and overall health. The combination of these ingredients is having a powerful effect on senior canines and those that suffer from stiff, sore and arthritic joints. Many pet parents have reported their dogs having "new life breathed into" them. The glucosamine levels are lower than other products. 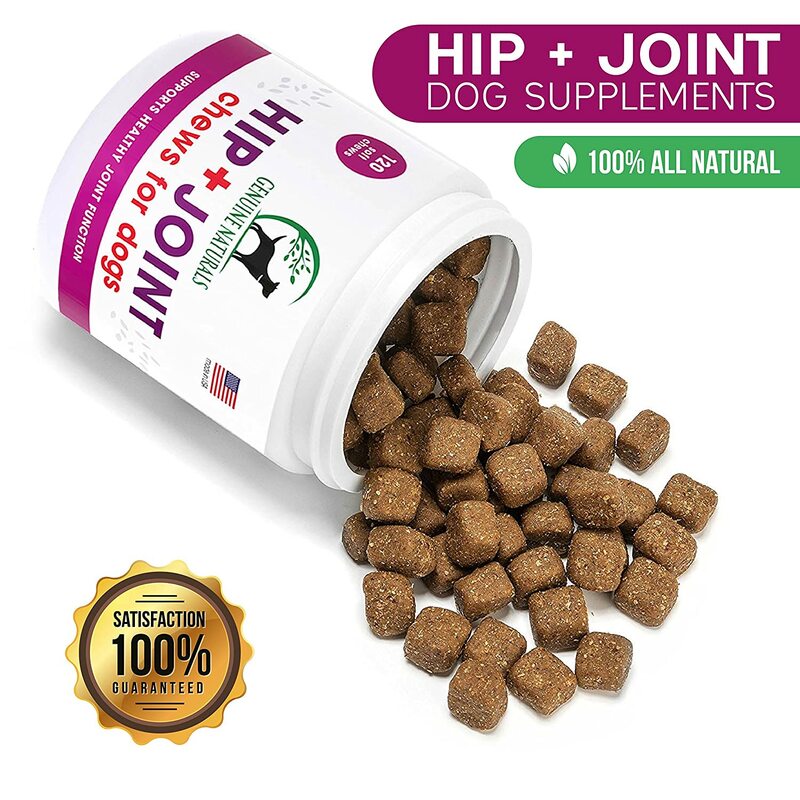 This joint supplement is made in the USA and not only contains glucosamine and chondroitin, but also other important vitamins, minerals and Omega-3 and 6 fatty acids. 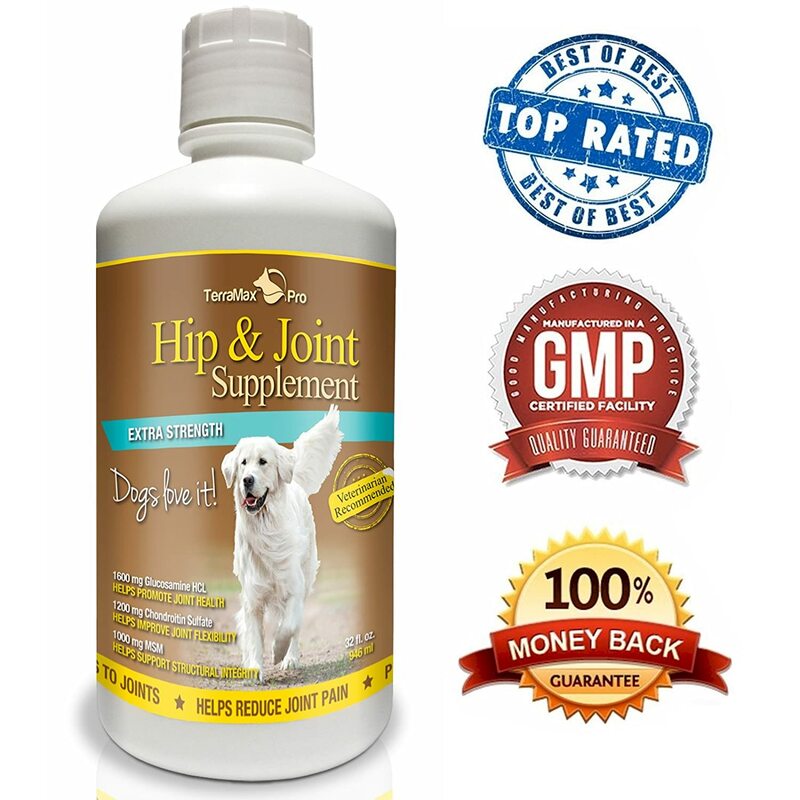 This joint supplement for dogs is made in an FDA registered factory under strict regulations to ensure your dog is only getting a top quality product. Doggie Dailies has been proven to relieve joint inflammation and promotes healthy ligaments and cartilage to give your dog back his freedom of movement. Some may view this product as being pricey. 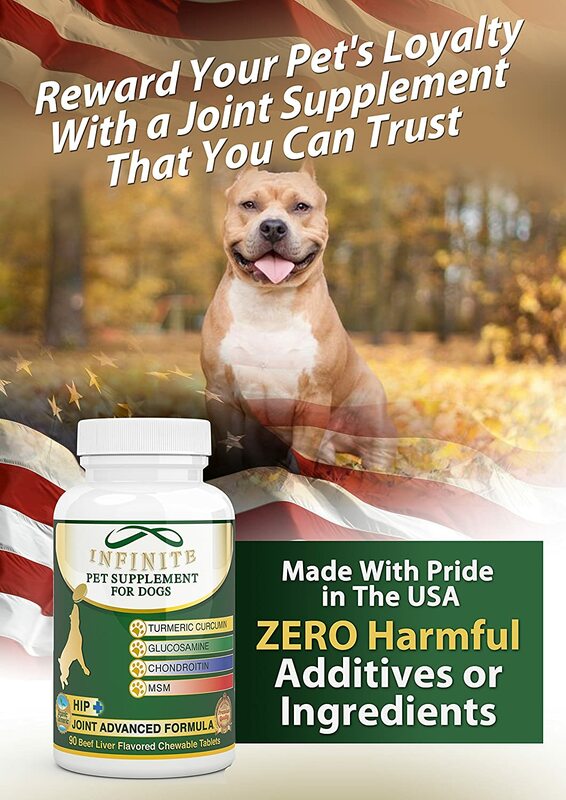 Made in the USA in a GMP certified facility, this joint supplement for dogs is setting the standards high. It not only contains those vital joint-health ingredients, but it also includes turmeric which has been proven to reduce inflammation, improve heart health, kills parasites, detox the liver and improves stomach health and metabolism. It is made from human-grade ingredients and has no side effects. One concern may be for some pet parents is this chew is only made in beef flavoring. This product is veterinarian recommended and is made for superior absorption in your dog's stomach. 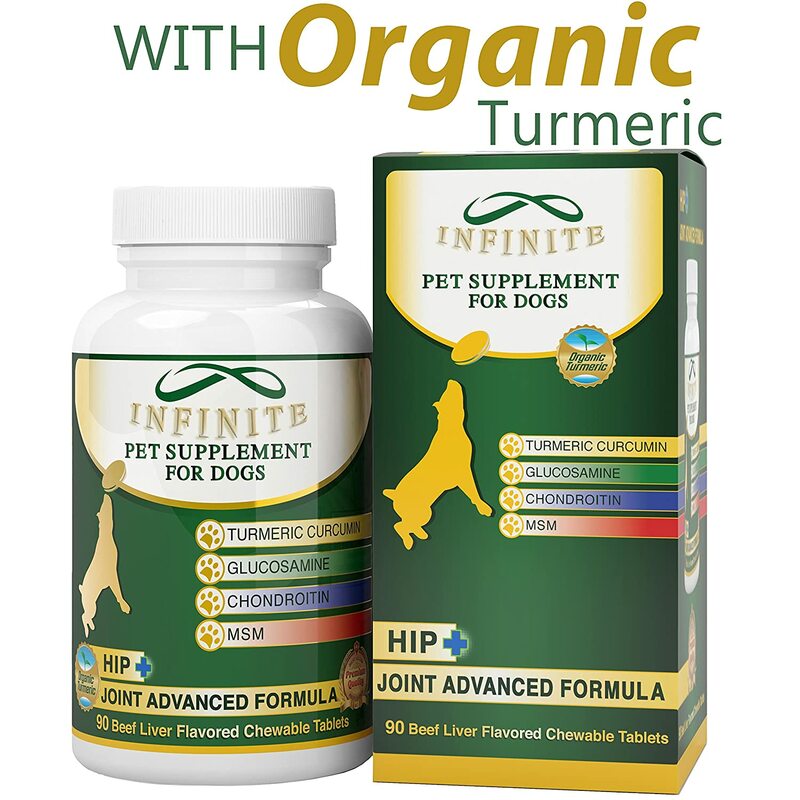 This 100% pure and all natural formula not only improves your canine's joint health, but it also improves its skin, helps with inflammation, wound healing, incontinence and stomach ailments. 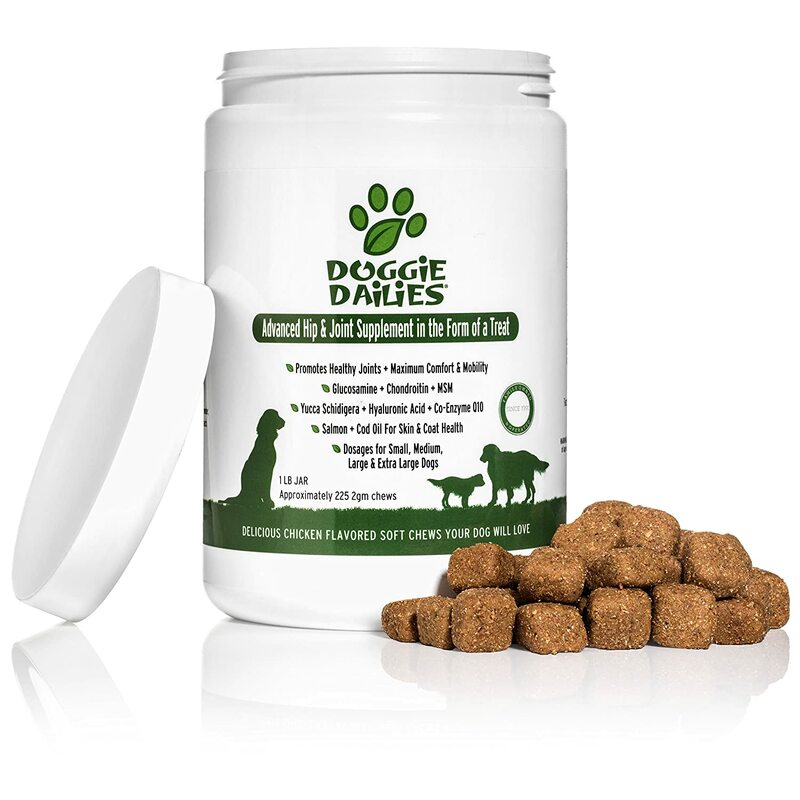 This liquid supplement was carefully crafted to contain no sugar, salt, starch, wheat, gluten, yeast, corn, milk or soy derivatives so it's healthy for even those dogs with allergies. Contains Glucosamine Hcl (shellfish): 1600 mg, Chondroitin Sulfate (beef and/or porcine) 1200 mg; MSM (Methylsulfonylmethane) 1000 mg, Manganese Chelate 7 mg, Hyaluronic Acid (as Sodium Hyaluronate) 10 mg.
Having good joint health is paramount to the well-being of our canine companions. By using one of these best joint supplements for dogs, you can help ensure your pet will live a happier, pain-free life. These five joint supplements have all earned high ratings with pet parents everywhere, so choose the one that works best for your dog. 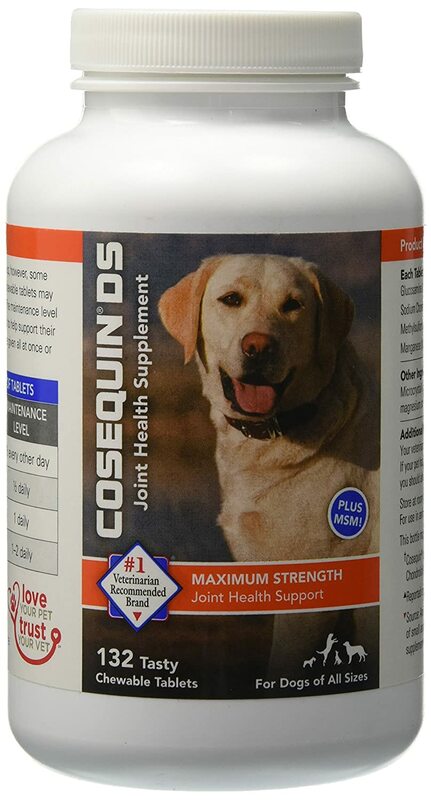 If you need further advice on joint supplements, be sure to consult with your veterinarian.